Surprisingly in all my years of working in bookstores and being a mystery lover, I have never picked up an Iris Johansen book. She's only written about...oh, 40 books or so. I just figured she'd always be there to some day pick up. I finally found that day. She is very good at what she does and because of it, she is kept very busy. Having never read any of the other books in the series, I got a small glimpse into Eve's world and personality. She has a lover, Joe Quinn, who happens to be a tough good looking cop (gotta love those). She has an adopted daughter Jane who she rarely sees. And she has a ghost...of her abducted daughter Bonnie, taken from her years ago. Her disappearance was never solved and it haunts Eve all these years later. She uses that pain to guide her and motivate her to find the identity of her victims, mostly children. She wants to give the hurting parents the closure she never had. I think I may like Eve. I think I may want to go back and read more about her. I didn't necessarily feel like I was missing out on a whole lot for this particular book but for my own weirdness in reading books in order, I may go back and see how it all started. Chasing the Night matches Eve up with Catherine Ling, a troubled woman who is searching for her own lost child, Luke. Luke was taken when he was 2 by a Russian gangster that Catherine had brought down during her time in the CIA. Rakovac, the gangster, has been baiting Catherine for years, torturing her by not telling her whether Luke is alive or dead. Catherine is determined to end this game and find her son, nine years later. She approaches Eve, knowing she can help her do an age progression on Luke. Eve is known for caring for her subjects, especially children, and will stop at nothing to help. Though hesitant at first, Eve agrees to help Catherine in the initial age progressionn. Ultimately they become friends and Eve takes it even further and goes with Catherine to find Luke and kill Rakovac. This book was definitely fast paced but a bit too full of espionage for me. I was more interested in Catherine and her son and what Eve did for a living. That was the intriguing part. It got a little too involved with the business of Rakovac, the CIA, the terriorism, etc. I find myself wanting to watch movies like that but not really wanting to read books that involve too much of that kind of storyline. That was really my only issue with it. 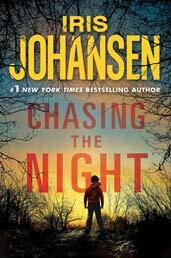 It seems Iris Johansen can piece together a heart pounding thriller. As a mother, she could really tear at your heart strings with the pain these mothers go through. There are a whole mess of side characters that come in that really make it more involved. Joe Quinn, Eve's lover, was by far, the most intriguing, in my opinion. I just love those rugged cops! I would recommend it for thriller fans. It definitely has more of an edgy feel to it with all of the hopping from country to country and the terror threats and the CIA involvement. I am a fan of tough female characters and Eve Duncan certainly fits that. I am certainly going to look into her early books in this series. Thanks to Ann Marie from Get Red PR for allowing me the chance to finally read Iris! I was like Iris Johansen sounds fimilar and then you said she has over 40 books :-0 oh my, now I feel guilty that I haven't read one either especially when I am a mystery fan, I will have to fix that. I have never read this author and know she's written a ton of books. Glad you liked this one. Wow...a forensic sculptor....sounds interesting! Instantly having a flashback of BONES in my head.....Angela does some crazy recreation stuff with all sorts of mediums too. I've just recently started reading more books in the mystery genre but even at this stage, I've heard of this author. She is certainly prolific and its great to hear that her writing (or at the very least this one in particular) speaks highly for her. Thanks for sharing...and happy reading! To look cool...and to be cool. Til death do us part...THINK..PINK!" I have read a bunch of Johansen's books and I would say the Eve Duncan ones were good to start with but I got bored because in many ways Eve never developed (at least for me) as a character. She became predictable after the first few books so now I skip those. If you want to try something without Eve in it, I'd recommend The Ugly Duckling. I think that has to be one of my favorites by this author. Iris Johansen has been around as long as Kay Hooper and Nora Roberts. These three writers are the best of the best. If you have not read her Eve series you should, I believe you would enjoy them. Even though each book stands alone, starting from the beginning book and reading through really lets you see the characters develop and grow. Love Iris's books.